Fish Lure Toilet Seat Fishing Toilet Seat with visible harmful lures! Fishing Toilet Seat with visible harmful lures! Maybe this is one of those things that is the perfect gift for a fisherman who has everything, but one thing for sure, if you like fishing or rustic decor, you will love the quality and beauty of this seat. 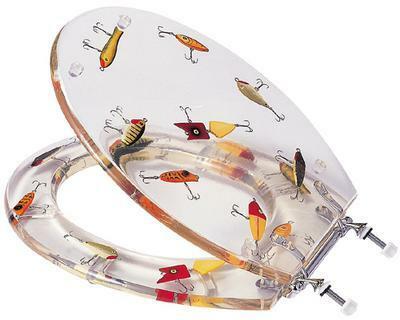 Decorative PVC Toilet Seats A transparent PVC seat with resin antique lure replicas molded inside. A real conversation piece.